This year Reading Guinea Pig Rescue has seen a big drop in the number of guineas that have been rehomed. Currently 25 guinea pigs have been rehomed, whereas last year 46 guineas went to Animal Welfare Act compliant (or above), homes. Twenty guinea pigs were surrendered to us this year, with a further twenty starting 2009 with us. Obviously we have been able to take in fewer because fewer have been rehomed- it’s not that there are not any guinea pigs needing new homes, we have just had to refer them to other rescues and hope that they had the space. We end the year with fourteen guineas still with us, most ready to go to their new home. The aim for this year was to take in less than we rehomed which we have achieved, by doing this we can ensure, to a certain degree, that we are meeting the demands of the community and will not burden the rescue with more than we can reasonably cope with. Twelve of the guinea pigs rehomed this year went to Humans that have adopted from RGPR before, with one of them adopting her eighteenth guinea pig from us since 2002! 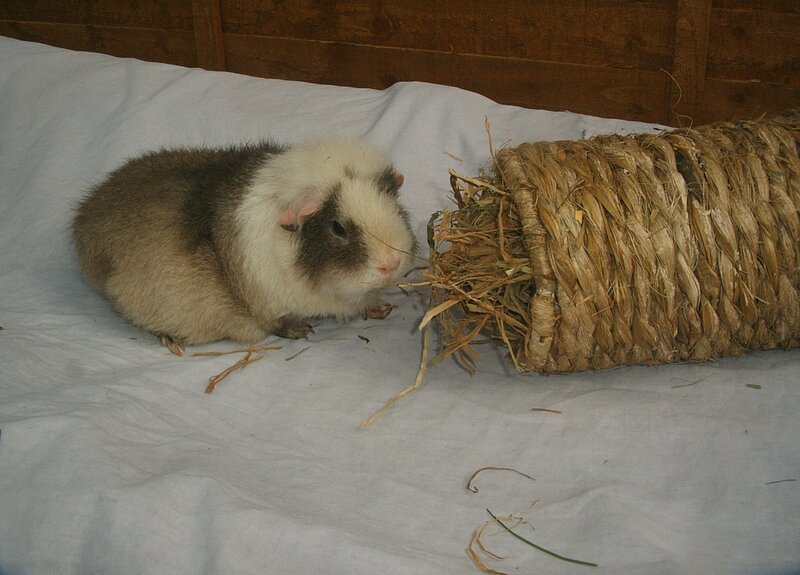 Chrissie prefers to adopt boars where possible and will only adopt guinea pigs over the age of two years, with Mr. Happy being the eldest at 5 years when he was adopted, he was castrated and lived happily with his sowfriend who also came from RGPR originally. Only six of the Humans that adopted from us this year were new to us. It is noticeable that the majority of people that adopt our guinea pigs are already keeping them and often have a lone guinea that needs pairing. Many thanks to everyone who has helped with boar pairing, I do not have the room to keep enough ‘entire’ boars here for boar pairing, but am happy to refer people to other sources (these are not included in RGPR’s rehoming data). Our Piggy PM this year raised £224.98 and we have now bought our blocks of hutches with the funds from the 2008 Piggy PM. Left over funds are being spent on an extension to the big shed (the small one has been taken down), although this will be an ongoing fundraiser so far we have managed to have a signicant amount of work done and lighting has been put in for ease of use! This will only be used as a much needed storage space for hay etc and will give more space to allow us to grow Cereal grasses; all in all meaning fewer deliveries of dry food and hay will be needed, the guineas get Cereal Grass more frequently (which should cut the fresh food bill costs) and cleaning out becomes much easier in the winter because of the extra light. The whole shed is much more secure now and has a triple door entry- two half wire and one full. We look forward to the spring when the inside can be fitted out and the finishing touches done. Thanks to everyone who has helped raise money for this and those who have listened to my ever so specific building instructions! Looking forward to 2010 we will be celebrating our ninth year in rescue and rehoming in February with a Piggy PM (20/2,). In our very first year we rehomed less than 10 guinea pigs, how ever this was without a website or internet advertising, all our rehoming was done through RSPCA contacts or the local newspaper. Our relationship with Active Vetcare was still in the early days and we never had any of the boars castrated. Since then our average rehoming figures have been around the forty mark for the Reading and Oxon area, all homes are now Animal Welfare Act compliant, usually above. Previously we had own specifications and the only thing we have needed to change is the width/depth of the cage, we now insist on cages that are four foot by two foot (120cm by 60cm) and can point adopters in the direction of suppliers. Once again we hope to keep to ‘sensible numbers’ of rescue guinea pigs and take in less than we rehome. Based on this year’s figures RGPR should only take in twelve guinea pigs next year- that is based on rehoming twenty five… According to pet shops and breeders in this area it has been a ‘bad year’ for rehoming/selling all round, which is interesting given the release of the G Force film which was predicted to ‘boost sales’ of guinea pigs. As well as this I have not had the predicted ‘fall out’ from the film of people wishing to rehome impulse bought pets, not a bad thing of course, that is providing they are not being ignored at the bottom of the garden. … to everyone who has adopted a guinea pig or two from RGPR this year, without your support we cannot continue to do this, and so many rescues are ‘folding’. To Pet Fayre a local small pet shop who also support the local RSPCA Branch by putting up rehoming posters and referring people to them. This year they have sent several people our way for advice, one which probably saved the lives of several guinea pigs and certainly saved them a lot of discomfort. Thank you to my home checkers, one of whom has won an RSPCA award for her meritous service to the branch- well done. Everyone who helps and supports at the Piggy PMs, these are incredibly difficult to plan and execute and would not happen without everyone’s input. We work as a team we work well to promote the basic care information that people need as well as having a good time ourselves. Yet again we will have more new faces on board at our next Piggy PM, some of whom have already done lots of behind the scenes work. Jenny and the team at Active Vetcare, who were especially accomodating one afternoon when we rushed in with Gem who had just given birth to a breech pup and had another in the car on the way there. Thanks also to Spike’s Human who had to wait while we had our little emergency- how bizarre that an ex resident should be there and we ‘take’ his appointment! My complimentary therapists (as I like to call them), with Jenny’s help we are tackling things we’d never have done before. Chrissie at Gorgeous Guineas for her wonderful skincare products, I still haven’t used anything else. To the Reading and Oxon Branch of the RSPCA for your financial help with veterinary bills and for being generally supportive. Merry Christmas everyone and see you in the New Year. The following article was composed by some year 6 pupils at a local school for their school newspaper. Although interviews are something I have learnt to ‘shy away from’ as they often portray what is said differently to how it is originally intended (and has resulted in some unwanted conflict in the past! ), I decided to go ahead with this one, maybe children are more persuasive?! The most suprising thing, for me, that came from this was how shocked they were that I don’t induldge in buying Christmas presents for my guinea pigs. I think I was expected to have bought them a fleece basket/blankets or something else that is highly impractical when you have a large number of guineas. I’m sure they are all now aware that a bag of hay is a much better idea as whatever you get guineas for Christmas they will inevitaby want to eat it at some stage! 🙂 It’s Christmas every day on Planet Guinea 🙂 . Are you thinking of getting a guinea pig for Christmas? Well did you know that Mrs Le Cras is a guinea pig re-homing coordinator for Reading with Oxon borders RSPCA? Lots of guinea pigs end up as unwanted pets every year. In 2008 Reading Guinea Pig Rescue took in 60 guinea pigs, this year they have been able to take in a lot less because not as many have been re-homed. In 2008 43 guinea pigs went to Animal Welfare Act Compliant Homes, but only 25 got rehomed in 2009. 1. Why did you choose to save guinea pigs and not cats or dogs? Reading does not have an RSPCA centre; all animals are fostered in private homes so it would not be practical to “save” cats or dogs as I work full time. 2. Do you enjoy looking after guinea pigs? If so, why? Yes, guinea pigs are my favourite small animal. I think they have a great attitude to life: “Let’s make it as easy as we can for ourselves”. I love the behavioural aspect of rescuing guinea pigs, many have behavioural issues when they arrive and have been labelled as ‘lone guinea pigs’, for example; with a little time and patience they soon get back to being sociable guinea pigs again and lose their label. 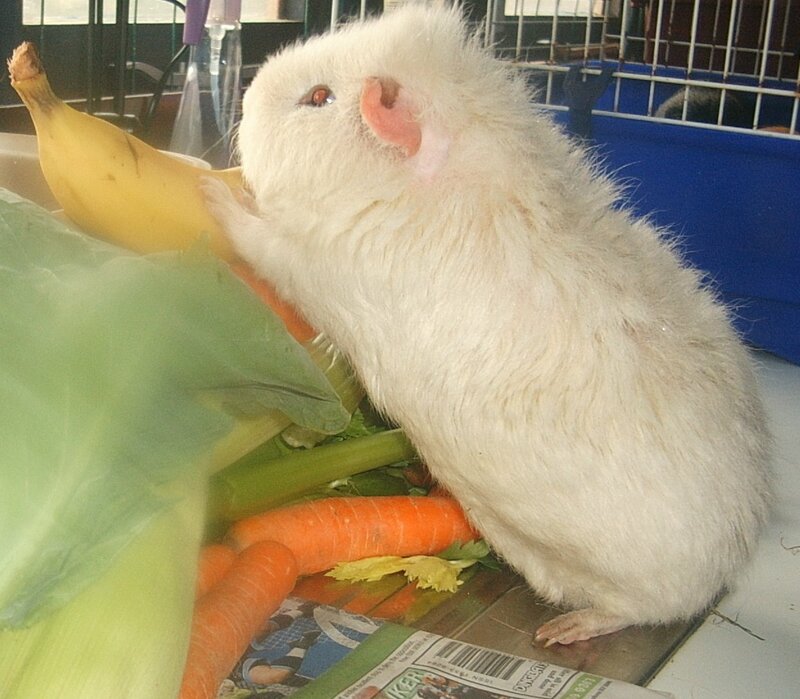 Nutrition is another aspect of their care I am particularly interested in and I have formulated a diet that is given out by my vet to local guinea pig owners. 3. Do you buy your guinea pigs Christmas presents? No, Christmas is for Humans, many of the stores that supply Christmas presents for pets also supply guinea pigs without adequate information resulting in them ending up with me, I have no wish to support that. A local small pet shop does donate some quality hay to the guinea pigs every year at Christmas which is thoughtful. 4. What is the point of “saving” guinea pigs? Looking at the bigger picture we are not only “saving” guinea pigs, we are educating their owners by supplying them with all the information they need. In 2009 nearly all the guinea pigs we rehomed went to people that have had guinea pigs from us before- one person has had a total of 18 guinea pigs from me since 2002. By “saving” guinea pigs we have established better veterinary care for guinea pigs at Tilehurst Active Vetcare, and guinea pigs from all over the South of England now visit them. Rescue is about more than finding new homes for guinea pigs, in my opinion. 5. How many guinea pigs have you got all together? At the time of writing I have 14 guinea pigs that are or will be (when they are well) looking for homes. I also have some of my own that I take to open days (at Tilehurst Active Vetcare centre) for the public to hold and to be used in, for example, syringe feeding demonstrations given by a vet. They’ve also been used at vet lectures. 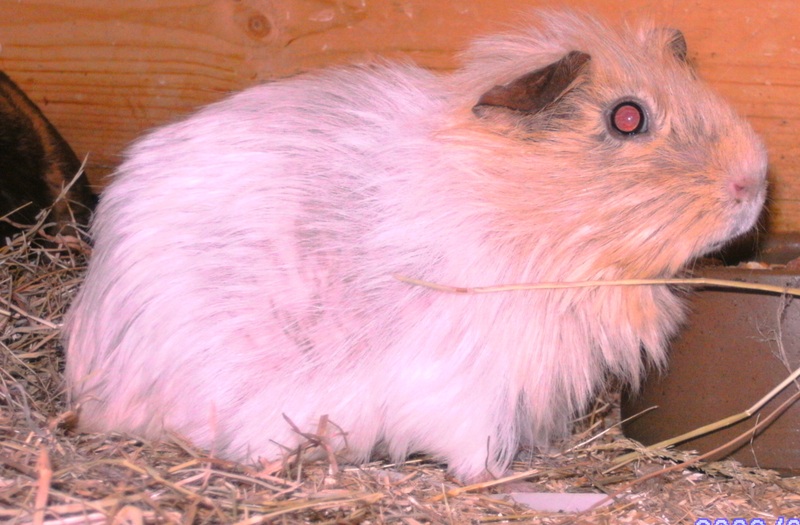 Sandy is typical of the guinea pigs that arrive here; she had a parasitic problem (evident by hairloss on her face) and the hairloss on her sides was symptomatic of a hormonal issue. Both problems have been cured and Sandy will be looking for a new home in 2010.
Cooper has left us to be a star on Planet Guinea. He’s the shiny but patchy one that makes very definite movements around the other stars up there. 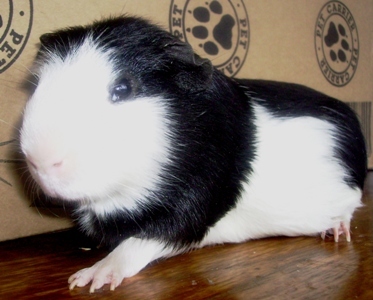 Cooper was a black and white patched Satin guinea pig who arrived from another rescue. The start of his little life is unknown, he came to a guinea pig rescue from a predominantley cat and dog rescue. 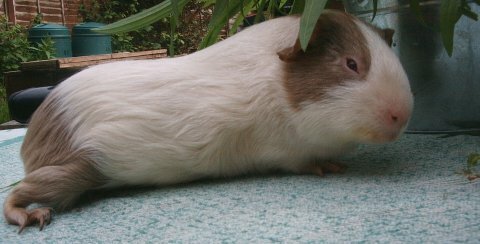 At that time he had a post castrate abscess (which had gone unnoticed) and it hadn’t been recognised that he was a Satin guinea pig, neither were the issues with Satins known by this rescue. He spent a good year with the guinea pig rescue before arriving here with Rosa and Jasmine. Because of his matt and satin coat there was never any intention to rehome him, instead he had his own group of girls who he kept in line should anyone fall out 🙂 Cooper went to Piggy Pms where he was a good example of a Satin ‘pet’. It was easy to tell he was a sdatin because of his white nose but from his mostly black side, towards the back, he could be a matt guinea pig. Because of the nature of the group there weren’t many new People introduced, but Miss Lucky met Cooper earlier this year and her reaction to Cooper’s ‘ways’ were remarkably different to how she responded to Cloud, if Cooper’s girls had been more accomodating of her issues Cooper would have accepted her into the group after making his position clear. The same couldn’t be said of the lovely Lily, Cooper was not having Lily in the group and cornered her, standing guard in case she should try and pass, his ducking and diving demonstrated that she was not welcome as a part of his group. Cooper, on the day he arrived. Not only is the Lovely Lily getting much more responsive by the day, tonight she was giving Sunshine, Babe and Zola an Earwash- whether they liked it or not. She licks in fits and starts, almost like she’s lacking confidence? But on the other hand is very thorough with her grooming! My first thought was that she had mistaken Zola’s ear for a piece of hay and I watched waiting for a reaction from Zola when she felt a nip but it didn’t happen! Yet another step forward, and so soon!